Hyperthyroidism is a set of disorders that involve excess synthesis and secretion of thyroid hormones by the thyroid gland, which leads to the hypermetabolic condition of thyrotoxicosis. The most common forms of hyperthyroidism include diffuse toxic goiter (Graves disease), toxic multinodular goiter (Plummer disease), and toxic adenoma. See the image below. 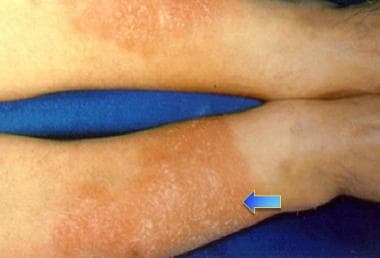 Bilateral erythematous infiltrative plaques on lower extremities in 42-year-old man with Graves disease are consistent with pretibial myxedema. Myxedematous changes of skin usually occur in pretibial areas and resemble orange peel in color and texture. Hyperthyroidism is a set of disorders that involve excess synthesis and secretion of thyroid hormones by the thyroid gland. The resulting elevation in levels of free thyroxine (FT4), free triiodothyronine (FT3), or both leads to the hypermetabolic condition of thyrotoxicosis. Thus, although many clinicians (endocrinologists excluded) use the terms hyperthyroidism and thyrotoxicosis interchangeably, the 2 words have distinct meanings. For example, both exogenous thyroid hormone intake and subacute thyroiditis can cause thyrotoxicosis, but neither constitutes hyperthyroidism, because the conditions are not associated with new hormone production. The most common forms of hyperthyroidism include diffuse toxic goiter (Graves disease), toxic multinodular goiter (Plummer disease), and toxic adenoma (see Etiology). Together with subacute thyroiditis, these conditions constitute 85-90% of all causes of thyrotoxicosis. For further information, see Pediatric Hyperthyroidism and Subacute Thyroiditis. Normally, the secretion of thyroid hormone is controlled by a complex feedback mechanism involving the interaction of stimulatory and inhibitory factors (see the image below). 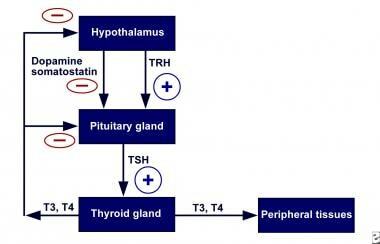 Thyrotropin-releasing hormone (TRH) from the hypothalamus stimulates the pituitary to release TSH. Hypothalamic-pituitary-thyroid axis feedback. Schematic representation of negative feedback system that regulates thyroid hormone levels. TRH = thyrotropin-releasing hormone; TSH = thyroid-stimulating hormone. Binding of TSH to receptors on the thyroid gland leads to the release of thyroid hormones—primarily T4 and to a lesser extent T3. In turn, elevated levels of these hormones act on the hypothalamus to decrease TRH secretion and thus the synthesis of TSH. Synthesis of thyroid hormone requires iodine. Dietary inorganic iodide is transported into the gland by an iodide transporter, converted to iodine, and bound to thyroglobulin by the enzyme thyroid peroxidase through a process called organification. This results in the formation of monoiodotyrosine (MIT) and diiodotyrosine (DIT), which are coupled to form T3 and T4; these are then stored with thyroglobulin in the thyroid’s follicular lumen. The thyroid contains a large supply of its preformed hormones. Thyroid hormones diffuse into the peripheral circulation. More than 99.9% of T4 and T3 in the peripheral circulation is bound to plasma proteins and is inactive. Free T3 is 20-100 times more biologically active than free T4. Free T3 acts by binding to nuclear receptors (DNA-binding proteins in cell nuclei), regulating the transcription of various cellular proteins. Any process that causes an increase in the peripheral circulation of unbound thyroid hormone can cause thyrotoxicosis. Disturbances of the normal homeostatic mechanism can occur at the level of the pituitary gland, the thyroid gland, or in the periphery. Regardless of etiology, the result is an increase in transcription in cellular proteins, causing an increase in the basal metabolic rate. In many ways, signs and symptoms of hyperthyroidism resemble a state of catecholamine excess, and adrenergic blockade can improve these symptoms. The underlying pathophysiology of Graves ophthalmopathy (also called thyroid-associated orbitopathy) is not completely characterized. It most likely involves an antibody reaction against the TSH receptor that results in activation of T cells against tissues in the retro-orbital space that share antigenic epitopes with thyroid follicular cells. These immune processes lead to an active phase of inflammation, with lymphocyte infiltration of the orbital tissue and release of cytokines that stimulate orbital fibroblasts to multiply and produce mucopolysaccharides (glycosaminoglycans), which absorb water. In consequence, the extraocular muscles thicken and the adipose and connective tissue of the retro-orbit increase in volume. Cigarette smoking and a high TSH-receptor autoantibody level are significant risk factors for ophthalmopathy. In addition, patients who smoke appear to be more likely to experience worsening of their ophthalmopathy if treated with radioactive iodine, as do patients who have high pretreatment T3 levels and posttherapy hypothyroidism. Genetic factors appear to influence the incidence of thyrotoxicosis. Autoimmune thyroid disease, including Hashimoto hypothyroidism and Graves disease, often occurs in multiple members of a family. Autoimmune thyroid disease has a higher prevalence in patients with human leukocyte antigen (HLA)-DRw3 and HLA-B89. Graves disease is felt to be an HLA-related, organ-specific defect in suppressor T-cell function. 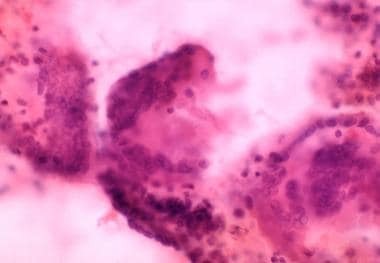 Similarly, subacute painful or granulomatous thyroiditis occurs more frequently in patients with HLA-Bw35. Like other immune diseases, these thyroid conditions occur more frequently in women than in men. With the availability of genome-wide association studies, more than a dozen genes and gene regions have been found to be associated with an increased risk for development of thyrotoxicosis, particularly Graves disease. [9, 10, 11, 12, 13, 14] Unsurprisingly, these studies have shown associations between these same genes and the development of other endocrine autoimmune disorders, such as type 1 diabetes mellitus. The loci for which specific function can be deduced appear to involve genes related to HLA, non-HLA immune function, and thyroid function. However, the odds ratios that have been determined generally indicate only a mildly increased risk for Graves disease. Most of the genome-wide association studies have focused on diffuse toxic goiter (ie, Graves disease). One study, however, found an association between development of toxic multinodular goiter (Plummer disease) and a single-nucleotide polymorphism (SNP) in the TSHR gene.  . This SNP was seen in 9.6% of normal patients, 16.3% of patients with Graves disease, and 33.3% of patients with toxic multinodular goiter. Iodine intake also appears to influence the occurrence of thyrotoxicosis. Clearly, patients in borderline iodine-deficient areas of the world develop nodular goiter, often with areas of thyroid autonomy. When members of this population move to areas of sufficient iodine intake, thyrotoxicosis occurs. Evidence exists that iodine can act as an immune stimulator, precipitating autoimmune thyroid disease and acting as a substrate for additional thyroid hormone synthesis. The most common cause of thyrotoxicosis is Graves disease (50-60% of cases). Graves disease is an organ-specific autoimmune disorder characterized by a variety of circulating antibodies, including common autoimmune antibodies, as well as anti-TPO and anti-TG antibodies. The most important autoantibody is thyroid-stimulating antibody (TSab; also called TSI, LATS, or TRab), which is directed toward epitopes of the TSH receptor and acts as a TSH-receptor agonist. Like TSH, TSab binds to the TSH receptor on the thyroid follicular cells to activate thyroid hormone synthesis and release and thyroid gland growth (hypertrophy). 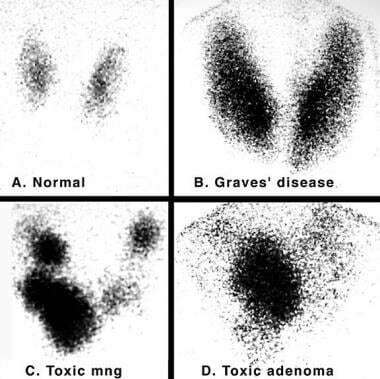 This results in the characteristic picture of Graves thyrotoxicosis, with a diffusely enlarged thyroid, very high radioactive iodine uptake, and excessive thyroid hormone levels compared with a healthy thyroid (see the images below). 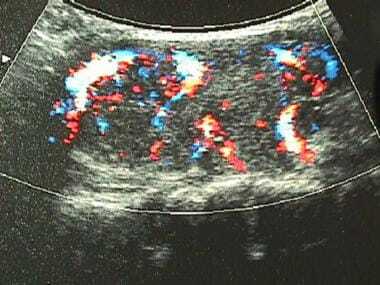 Color flow ultrasonogram in patient with Graves disease. Generalized hypervascularity is visible throughout gland (note red areas), which often can be heard as hum or bruit with stethoscope. Iodine 123 (123I) nuclear scintigraphy: 123I scans of normal thyroid gland (A) and common hyperthyroid conditions with elevated radioiodine uptake, including Graves disease (B), toxic multinodular goiter (C), and toxic adenoma (D). Thyroid hormone levels can be highly elevated in Graves disease. Clinical findings specific to Graves disease include thyroid ophthalmopathy (periorbital edema, chemosis [conjunctival edema], injection, or proptosis) and, rarely, dermopathy over the lower extremities. This autoimmune condition may be associated with other autoimmune diseases, such as pernicious anemia, myasthenia gravis, vitiligo, adrenal insufficiency, celiac disease, and type 1 diabetes mellitus. The next most common cause of thyrotoxicosis is subacute thyroiditis (approximately 15-20% of cases), a destructive release of preformed thyroid hormone. 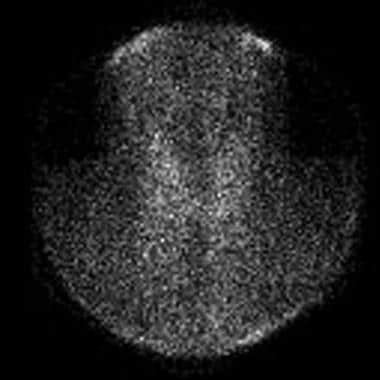 A typical nuclear scintigraphy scan shows no radioactive iodine uptake (RAIU) in the thyrotoxic phase of the disease (see the images below). Thyroid hormone levels can be highly elevated in this condition. Absence of iodine 123 (123I) radioactive iodine uptake in patient with thyrotoxicosis and subacute painless or lymphocytic thyroiditis. Laboratory studies at time of scan demonstrated the following: thyroid-stimulating hormone (TSH), less than 0.06 mIU/mL; total thyroxine (T4), 21.2 µg/dL (reference range, 4.5-11); total triiodothyronine (T3), 213 ng/dL (reference range, 90-180); T3-to-T4 ratio, 10; and erythrocyte sedimentation rate (ESR), 10 mm/hr. Absence of thyroid uptake, low T3-to-T4 ratio, and low ESR confirm diagnosis of subacute painless thyroiditis. 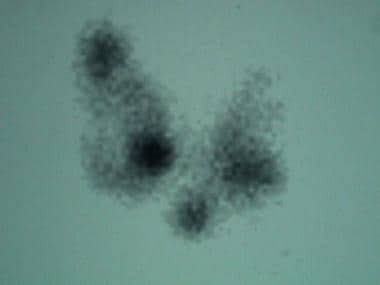 Three multinuclear giant cell granulomas observed in fine-needle aspiration biopsy of thyroid from patient with thyrotoxicosis from subacute painful or granulomatous thyroiditis. Toxic multinodular goiter (Plummer disease) accounts for 15-20% of thyrotoxicosis cases (see the image below). It occurs more commonly in elderly individuals, especially those with a long-standing goiter. Thyroid hormone excess develops very slowly over time and often is only mildly elevated at the time of diagnosis. Scan in patient with toxic multinodular goiter. 5-Hour 123I-iodine uptake was elevated at 28% (normal 5-15%). Note multiple foci of variably increased tracer uptake. Symptoms of thyrotoxicosis are mild, often because only a slight elevation of thyroid hormone levels is present, and the signs and symptoms of thyrotoxicosis often are blunted (apathetic hyperthyroidism) in older patients. However, very high thyroid hormone levels may occur in this condition after high iodine intake (eg, with iodinated radiocontrast or amiodarone exposure). Toxic adenoma is caused by a single hyperfunctioning follicular thyroid adenoma. This disorder accounts for approximately 3-5% of thyrotoxicosis cases. The excess secretion of thyroid hormone occurs from a benign monoclonal tumor that usually is larger than 2.5 cm in diameter. The excess thyroid hormone suppresses TSH levels. RAIU usually is normal, and the radioactive iodine scan shows only the hot nodule, with the remainder of the normal thyroid gland suppressed because the TSH level is low. Iodide-induced thyrotoxicosis (Jod-Basedow syndrome) occurs in patients with excessive iodine intake (eg, from an iodinated radiocontrast study). The antiarrhythmic drug amiodarone, which is rich in iodine and bears some structural similarity to T4, may cause thyrotoxicosis (see Thyroid Dysfunction Induced by Amiodarone Therapy). Iodide-induced thyrotoxicosis also occurs in patients with areas of thyroid autonomy, such as a multinodular goiter or autonomous nodule. Iodide-induced thyrotoxicosis appears to result from loss of the normal adaptation of the thyroid to iodide excess. It is treated with cessation of the excess iodine intake and with administration of antithyroid medication. Usually, after depletion of the excess iodine, thyroid functions return to preexposure levels. Patients with a molar hydatidiform pregnancy or choriocarcinoma have extremely high levels of beta human chorionic gonadotropin (β-hCG), which can weakly activate the TSH receptor. At very high levels of β-hCG, activation of the TSH receptors is sufficient to cause thyrotoxicosis. Metastatic follicular thyroid carcinoma may also result in thyrotoxicosis. These lesions maintain the ability to make thyroid hormone, and in patients with bulky tumors, production may be high enough to cause thyrotoxicosis. Toxic multinodular goiter (15-20% of thyrotoxicosis) occurs more frequently in regions of iodine deficiency. Most persons in the United States receive sufficient iodine, and the incidence of toxic multinodular goiter in the US population is lower than that in areas of the world with iodine deficiency. Toxic adenoma is the cause of 3-5% of cases of thyrotoxicosis. The incidences of Graves disease and toxic multinodular goiter change with iodine intake. Compared with regions of the world with less iodine intake, the United States has more cases of Graves disease and fewer cases of toxic multinodular goiters. Autoimmune thyroid disease occurs with the same frequency in Caucasians, Hispanics, and Asians but at lower rates in African Americans. All thyroid diseases occur more frequently in women than in men. Graves autoimmune disease has a male-to-female ratio of 1:5-10. The male-to-female ratio for toxic multinodular goiter and toxic adenoma is 1:2-4. Graves ophthalmopathy is more common in women than in men. Autoimmune thyroid diseases have a peak incidence in people aged 20-40 years. Toxic multinodular goiters occur in patients who usually have a long history of nontoxic goiter and who therefore typically present when they are older than age 50 years. Patients with toxic adenomas present at a younger age than do patients with toxic multinodular goiter. Hyperthyroidism from toxic multinodular goiter and toxic adenoma is permanent and usually occurs in adults. After normalization of thyroid function with antithyroid medications, radioactive iodine ablation usually is recommended as the definitive therapy. Long-term, high-dose antithyroid medication is not recommended. Toxic multinodular goiters and toxic adenomas probably will continue to grow slowly in size during antithyroid pharmacotherapy. Generally, the thyrotoxic areas are ablated, and patients may remain euthyroid. Those who become hypothyroid after radioactive iodine therapy are easily maintained on thyroid hormone replacement therapy, with T4 taken once daily. Patients with Graves disease may become hypothyroid in the natural course of their disease, regardless of whether treatment involves radioactive iodine or surgery. Eye disease may develop at a time distant from the initial diagnosis and therapy. Generally, after the diagnosis, the ophthalmopathy slowly improves over years. An increase in the rate of bone resorption occurs. Bone loss, measured by bone mineral densitometry, can be seen in severe hyperthyroidism at all ages and in both sexes. In mild subclinical disease, however, bone loss has been convincingly shown only in postmenopausal women. Blick C, Jialal I. Thyroid, Thyrotoxicosis. 2018 Jan. [Medline]. [Full Text]. Frost L, Vestergaard P, Mosekilde L. Hyperthyroidism and risk of atrial fibrillation or flutter: a population-based study. Arch Intern Med. 2004 Aug 9-23. 164(15):1675-8. [Medline]. Gupta MK. Thyrotropin-receptor antibodies in thyroid diseases: advances in detection techniques and clinical applications. Clin Chim Acta. 2000 Mar. 293 (1-2):1-29. [Medline]. Feldt-Rasmussen U, Hoier-Madsen M, Bech K, et al. Anti-thyroid peroxidase antibodies in thyroid disorders and non-thyroid autoimmune diseases. Autoimmunity. 1991. 9 (3):245-54. [Medline]. Lumbroso S, Paris F, Sultan C. Activating Gsalpha mutations: analysis of 113 patients with signs of McCune-Albright syndrome--a European Collaborative Study. J Clin Endocrinol Metab. 2004 May. 89(5):2107-13. [Medline]. Betterle C, Dal Pra C, Mantero F, Zanchetta R. Autoimmune adrenal insufficiency and autoimmune polyendocrine syndromes: autoantibodies, autoantigens, and their applicability in diagnosis and disease prediction. Endocr Rev. 2002 Jun. 23(3):327-64. [Medline]. Plagnol V, Howson JM, Smyth DJ, Walker N, Hafler JP, Wallace C, et al. Genome-wide association analysis of autoantibody positivity in type 1 diabetes cases. PLoS Genet. 2011 Aug. 7(8):e1002216. [Medline]. [Full Text]. Simmonds MJ, Brand OJ, Barrett JC, Newby PR, Franklyn JA, Gough SC. Association of Fc receptor-like 5 (FCRL5) with Graves' disease is secondary to the effect of FCRL3. Clin Endocrinol (Oxf). 2010 Nov. 73(5):654-60. [Medline]. [Full Text]. Newby PR, Pickles OJ, Mazumdar S, Brand OJ, Carr-Smith JD, Pearce SH, et al. Follow-up of potential novel Graves' disease susceptibility loci, identified in the UK WTCCC genome-wide nonsynonymous SNP study. Eur J Hum Genet. 2010 Sep. 18(9):1021-6. [Medline]. [Full Text]. Nakabayashi K, Shirasawa S. Recent advances in the association studies of autoimmune thyroid disease and the functional characterization of AITD-related transcription factor ZFAT. Nihon Rinsho Meneki Gakkai Kaishi. 2010. 33(2):66-72. [Medline]. Chu X, Dong Y, Shen M, Sun L, Dong C, Wang Y, et al. Polymorphisms in the ADRB2 gene and Graves disease: a case-control study and a meta-analysis of available evidence. BMC Med Genet. 2009 Mar 13. 10:26. [Medline]. [Full Text]. Gabriel EM, Bergert ER, Grant CS, van Heerden JA, Thompson GB, Morris JC. Germline polymorphism of codon 727 of human thyroid-stimulating hormone receptor is associated with toxic multinodular goiter. J Clin Endocrinol Metab. 1999 Sep. 84(9):3328-35. [Medline]. van Dijk MM, Smits IH, Fliers E, Bisschop PH. Maternal Thyrotropin Receptor Antibody Concentration and the Risk of Fetal and Neonatal Thyrotoxicosis: A Systematic Review. Thyroid. 2018 Feb. 28 (2):257-64. [Medline]. Mittra ES, Niederkohr RD, Rodriguez C, El-Maghraby T, McDougall IR. Uncommon causes of thyrotoxicosis. J Nucl Med. 2008 Feb. 49(2):265-78. [Medline]. Davies TF, Larsen PR. Thyrotoxicosis. Larsen PR et al, eds. Williams Textbook of Endocrinology. 10th ed. Philadelphia: Saunders; 2003. 374-421. White A, Bozso SJ, Moon MC. Thyrotoxicosis induced cardiomyopathy requiring support with extracorporeal membrane oxygenation. J Crit Care. 2018 Feb 3. 45:140-3. [Medline]. Dahl P, Danzi S, Klein I. Thyrotoxic cardiac disease. Curr Heart Fail Rep. 2008 Sep. 5(3):170-6. [Medline]. Zhyzhneuskaya S, Addison C, Tsatlidis V, Weaver JU, Razvi S. The Natural History of Subclinical Hyperthyroidism in Graves' Disease: The Rule of Thirds. Thyroid. 2016 Jun. 26(6):765-9. [Medline]. Heeringa J, Hoogendoorn EH, van der Deure WM, et al. High-normal thyroid function and risk of atrial fibrillation: the Rotterdam study. Arch Intern Med. 2008 Nov 10. 168(20):2219-24. [Medline]. Hollowell JG, Staehling NW, Flanders WD, Hannon WH, Gunter EW, Spencer CA, et al. Serum TSH, T(4), and thyroid antibodies in the United States population (1988 to 1994): National Health and Nutrition Examination Survey (NHANES III). J Clin Endocrinol Metab. 2002 Feb. 87(2):489-99. [Medline]. [Full Text]. Porterfield JR Jr, Thompson GB, Farley DR, Grant CS, Richards ML. Evidence-based management of toxic multinodular goiter (Plummer's Disease). World J Surg. 2008 Jul. 32(7):1278-84. [Medline]. [Guideline] De Groot L, Abalovich M, Alexander EK, Amino N, Barbour L, Cobin RH, et al. Management of thyroid dysfunction during pregnancy and postpartum: an Endocrine Society clinical practice guideline. J Clin Endocrinol Metab. 2012 Aug. 97(8):2543-65. [Medline]. Stalberg P, Svensson A, Hessman O, et al. Surgical treatment of Graves' disease: evidence-based approach. World J Surg. 2008 Jul. 32(7):1269-77. [Medline]. Wang J, Qin L. Radioiodine therapy versus antithyroid drugs in Graves' disease: a meta-analysis of randomized controlled trials. Br J Radiol. 2016 Jun 27. [Medline]. Sisson JC, Freitas J, McDougall IR, Dauer LT, Hurley JR, Brierley JD, et al. Radiation safety in the treatment of patients with thyroid diseases by radioiodine ¹³¹i: practice recommendations of the american thyroid association. Thyroid. 2011 Apr. 21(4):335-46. [Medline]. Shindo M. Surgery for hyperthyroidism. ORL J Otorhinolaryngol Relat Spec. 2008. 70(5):298-304. [Medline]. Worni M, Schudel HH, Seifert E, Inglin R, Hagemann M, Vorburger SA, et al. Randomized controlled trial on single dose steroid before thyroidectomy for benign disease to improve postoperative nausea, pain, and vocal function. Ann Surg. 2008 Dec. 248(6):1060-6. [Medline]. [Guideline] Alexander EK, Pearce EN, Brent GA, et al. 2017 Guidelines of the American Thyroid Association for the Diagnosis and Management of Thyroid Disease During Pregnancy and the Postpartum. Thyroid. 2017 Mar. 27 (3):315-89. [Medline]. [Full Text]. FDA Drug Safety Communication: New Boxed Warning on severe liver injury with propylthiouracil. US Food and Drug Administration, April 21, 2010. Available at http://www.fda.gov/Drugs/DrugSafety/PostmarketDrugSafetyInformationforPatientsandProviders/ucm209023.htm. Accessed: March 6, 2012. Yalamanchi S, Cooper DS. Thyroid disorders in pregnancy. Curr Opin Obstet Gynecol. 2015 Oct 19. [Medline]. Burches-Feliciano MJ, Argente-Pla M, Garcia-Malpartida K, Rubio-Almanza M, Merino-Torres JF. Hyperthyroidism induced by topical iodine. Endocrinol Nutr. 2015 Aug 12. [Medline]. Brandt F. The long-term consequences of previous hyperthyroidism. A register-based study of singletons and twins. Dan Med J. 2015 Jun. 62 (6):[Medline]. Srinivasan S, Misra M. Hyperthyroidism in children. Pediatr Rev. 2015 Jun. 36 (6):239-48. [Medline]. Severe proptosis, periorbital edema, and eyelid retraction from thyroid-related orbitopathy. This patient also had optic nerve dysfunction and chemosis (conjunctival edema) from thyroid-related orbitopathy. Gross photo of subtotal thyroidectomy for diffuse toxic goiter (Graves Disease) showing homogenous enlargement without nodules. Low-power photomicrograph showing diffuse papillary hyperplasia (hallmark histologic feature of Graves disease). High-power photomicrograph showing papillary hyperplasia of follicular cells with increased nuclear size and small nucleoli. RAIU = radioactive iodine uptake; TSH = thyroid-stimulating hormone. * A normal 6-hour RAIU is approximately 2-16%; a 24-hour RAIU is about 8-25% but is modified according to the iodine content of the patient’s diet. RAIU or scanning should not be performed in a woman who is pregnant (with the exception of a molar pregnancy) or breastfeeding.